It has been a rollercoaster of emotions this last 36 hours. We had a really hard time finding a hotel, we spent like 12 hours looking for something available and in our price range. I really appreciate all of your advice yesterday, and as much as we would have liked to be able to stay right in Manhattan or near Times Square, we just could not find anything. So we are staying at a nice place about 14 miles away, and there is a train station directly across the street which we can catch to ride for 25 minutes into midtown. We called the hotel and they said that it only costs $12 roundtrip to ride the train. So that is the best solution we came up with. I hope it works out well. We bought tickets to see two shows. We will see a matinee of Hairspray and later that night Chicago. I am so excited to see Chicago. That is one of my favorite soundtracks, and I loved the movie. We plan on going to Central Park and Times Square (of course), but we still haven't decided what else we definitely must see. 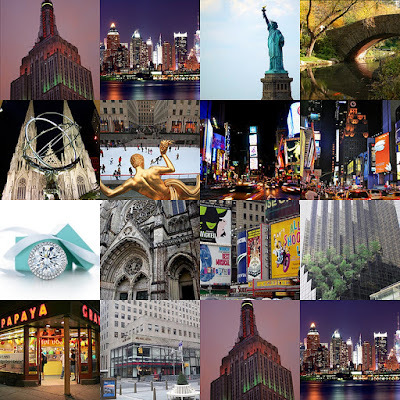 Considerations are the Empire State Building, the Statue of Liberty, a museum (which one? ), Tiffany's (I vote for this one), shopping of course, but where? Michael will also be performing on the Today show on Tuesday morning which we will for sure be at, so make sure you watch! I will have a big sign with guess who's name on it!!!!!!!! In all the excitement of yesterday's information, I still didn't get any book recommendations. I don't really enjoy flying, in fact, I get pretty nervous, so having a good book and my music to immerse myself into really helps. Please let me know what great books you all have read. I hope you all have a great weekend, it looks like it will be warm and beautiful here, doesn't look too bad in NYC either! I will report here on all the fun on Wednesday.